"You know that Nelson Mandella quote? Our deepest fear is not that we are inadequate, our deepest fear is that we are powerful beyond measure? It is our light, not our darkness, that most frightens us? Blah, blah, blah, whatever he says?" "What do you mean, 'there's nothing to fear but fear itself?' Hey, great. Now I'm scared of fear. Thank you very much. Wasn't before." Ellen DeGeneres isn't one of those goofy celebrities that expects you to address them with only one name, like, say, Roseanne, Oprah, or Cher. She might as well be, however, because few people made as much of an impact on TV in the 1990s as she did. Her character's "coming out" on the sitcom Ellen was a monumental moment of television; the show became the first in history to feature a lead character who was gay. The episode drew a surprising number of viewers (and a depressing number of protests and sponsor boycotts), but the ratings spike quickly ebbed as the show tried to tackle homosexuality as a complex realistic issue. After all, heaven forbid our sitcoms deal with such a realistic and pressing matter. I was a fan of Ellen (aka These Friends of Mine) early on. While I never found Ellen herself all that physically attractive, her comedic style is adorable. She has a rambling, natural delivery that I find very endearing and an impeccable comic timing. I was sorry to see her show canceled so soon, but in retrospect it was becoming less of a comedy and more of a drama. She needed to move on to other things. Evidently, one of those things was a new HBO special appropriately titled The Beginning: A Comedy Special for the Ages. I have never had the opportunity to go to a comedy club myself, so I am glad that specials like this exist. It is nice to see someone "out of character." Ellen especially comes across as very relaxed and personable. It wasn't as laugh-out-loud funny as I was expecting (especially after her riotous appearance on Jay Leno a few weeks back), but there are still some very funny moments as well as some nice, more serious commentary on her life experiences. If you are expecting a lot of "gay humor," don't. She knows the audience expects her to comment on her coming out, and she does right off the bat (with a very funny interpretive dance), but it is not the overall focus of this special. Instead, she covers such varied topics as the inanity of having shampoo directions printed on the bottle ("Lather, rise, repeat... BUT HOW MANY TIMES? "), to ants ("I wonder if there are ants in the back of the line with road rage going, 'What's the holdup? '"), to my personal favorite, cheese ("Lesbian demands cheese, causes riot"). She has basically the same observational style of comedy made popular by Jerry Seinfeld, but her performance really sells it. She is one of the few comedians smart enough not to laugh along with the audience. Often her funniest material is presented as a quick aside, and she has moved on before the audience has gotten the joke. This isn't Ellen's best material, but a lot of it is very funny. She is one of my favorite female comedians (third only to Paula Poundstone and Janeane Garafalo), and this HBO special is well worth a look for fans and newcomers alike. "I'm on the patch right now. It releases small doses of approval until I no longer need it."" Well, Ellen, you can get your approval fix from me. Image Transfer Review: This picture is generally very pleasing. I noted no edge-enhancement or shimmer to speak of. Color contrast is good and the black level is fine as well. Nothing flashy (after all, it IS just one person up on a stage), but it gets the job done. Audio Transfer Review: This mix is about as basic as you can get. Ellen's performance is anchored in the center, and the audience reactions are filtered through the left and right mains. Speech is always understandable, so I can't really fault this mix. After all, it's not like a lot of flashy panning effects were really necessary. Extras Review: Aside from a brief text biography of DeGeneres, this disc is featureless. Not even the basics, like subtitles, were included. Ellen's comedy may be an acquired taste. Her performance style certainly is. Many people do not find her rambling, laid-back style very funny. If you do, however, you will very much enjoy this HBO special. 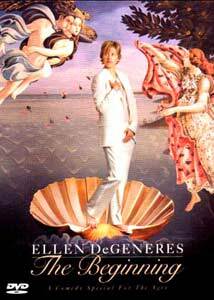 The disc is a bit short on the basics (no subtitles) but it is still well worth the money for Ellen fans.